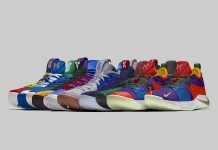 Joining the upcoming Nike Basketball NCAA March Madness Collection, which includes the Nike PG 2 and Kobe AD, is the Nike Kyrie 4. Highlighted with its colorful marble-like rubber outsole, the shoe features a White upper with textile overlays. An iridescent Nike Swoosh logo, Black speckled midsole and 3M Reflective tongue tab completes the design. Look for the Nike Kyrie 4 “March Madness” to release on March 22nd at select Nike Basketball retailers and Nike.com. The retail price tag is set at $120 USD.